I know what you’re thinking — el fin de Delfin? No puede ser! Quien no creyÃ³ en Santa, no me digan que mÃ¡s de algÃºn 24 de diciembre no miraron por la ventana esperando ver un trineo, quien no le creyÃ³ a su novia cuando te dijo: sÃ³lo contigo habÃ­a sido tan puta o quien no le creyÃ³ a la televisiÃ³n y pensÃ³ que un desodorante de mierda te podÃ­a conseguir una chica, por favor, si hasta yo lo sigo comprando. Y quien no le creyÃ³ a DelfÃ­n, bueno, nosotros si, pasamos largas noches posteando su video cuando reciÃ©n tenia 5 mil visitas, luego subimos el blog, reventamos la red, en una semana de posteos pudimos hacer que Torres Gemelas lo vean mÃ¡s de 250 mil personas, ahora ni hablar, armamos la gira y se fue a Chile, salio en TV, prensa y hasta en la China, pasamos mÃ¡s noches subiendo videos de DelfÃ­n que atendiendo a nuestras chicas, y valiÃ³ la pena, logramos que DelfÃ­n tenga mÃ¡s homenajes que Madonna y que por fin alguien en el mundo pueda saber de un artista ecuatoriano. Logramos lo que querÃ­amos, darle a este chico pero gran paÃ­s un espacio en el mundo globalizado y por sobre todo, divertirnos. Pero la diversiÃ³n se acabÃ³, ya no creemos en DelfÃ­n, es una pena enorme pero asÃ­ es la vida, es creer y dejar de creer. De despedida los queremos dejar con otro artista ecuatoriano que nos pareciÃ³ divertido, espero a ustedes tambiÃ©n les guste. Who did not think in Santa, they do not say me that more of some 24 of December they did not watch after the window hoping to see a sleigh, that her fiancÃ¨e did not believe to him when she said to you: only with you it had be so puta or who did not believe to him to the television and thought that an excrement deodorant could obtain a girl to you, please, if until I continue it buying. And who did not believe Dolphin to him, good, we if, we passed long nights posteando its video when just tapeworm 5 thousand visits, soon we raised blog, burst the network, in one week of posteos we could cause that Twin Towers see more than 250 thousand people it, now nor speak, armed the tour and he went to Chile, salio in TV, presses and until in China, we passed the more nights raising videos of Dolphin that taking care of our girls, and was worth the trouble, we obtained that Dolphin has the more tributes that Madonna and that finally somebody in the world can know of an Ecuadorian artist. We managed what we wanted, to give to this boy but great country him a space in the globalizado world and by mainly, to amuse itself. But the diversion finished, no longer we create in Dolphin, is an enormous pain but thus it is the life, it is to believe and to let believe. Of goodbye they want them to leave with another Ecuadorian artist who seemed to us amused, I also wait for you likes. Good bye. Of course, this all simply begs the question: where do we go now to find the latest homenajes to “Torres Gemelas”? Searching YouTube for Delfin, of course, leads to innumerable copies of the original video, various clips of actual dolphins (doing the darnedest things, wouldntchaknow), and, yes, a few homages. But there’s no filter quite like that blogspot. If the real Delfin Quishpe knew what was good for him, he’d get that blog going again — and release a new video! Until then, we have Ecuadorian Behind-the-Music-style specials to keep us warm. After running my “Zunguzung” paper through the ringer at EMP the week before, I’ll be offering a slightly different (and no doubt revised) version at the annual US meeting of the International Association for the Study of Popular Music (or “yaspum,” as we say it). The conference takes place at Northeastern University from April 26-29; a preliminary conference program (w/ abstracts) is available here (my own paper’s panel is on Saturday, April 28, from 10:15 – 12:00pm, in Room 346). 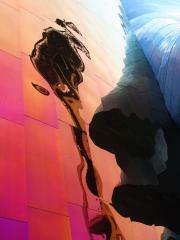 Back from Seattle, which was a blast (see below). Off to Boston tomorrow. Gonna be in the Bean (and the Bridge) for a spell, presenting a revised version of the Zunguzung tale I told this past weekend, weighing in on the White Rapper Show alongside some hip-hop(-studying) ethnomusicologists, and delivering what have become my annual lectures on Caribbean music in Orlando Patterson’s “Caribbean Societies” class. I’m also DJing an organic farm benefit. Tony Rebel anyone? Anyhow, you get the picture, even if this is inaccurate and doesn’t capture Sasha’s emotive inflection. Finally, to top off the weekend in Seattle (which I should note, contrary to legend, aside from a lil drizzle, was warm and sunny almost the entire time), I met up with Filastine at about 1am on Saturday night, post-Matos’s-post-conference party, and he took me to an all-night underground speakeasy type of thing, complete with cabaret and craps tables. It was something else. Lots of kids dressed to the nines, pretending it was the 20s, wading through warehouse puddles in their finery. The proprietors asked me to DJ, and lucky enough I still had my laptop with me. I was happy to take people into the wee hours, spinning across some crunk genealogies from about 4 to just after 6am. We capped the long night w/ some breakadawn couscous and (what Filastine called) “Indian Space Food” for breakfast. After grabbing a little sleep and some dim sum, it was back to the airport. And, now, I’d better wrap up this post, so I can head back to the airport once again. From April 19-22, I’ll be participating in this year’s EMP conference in Seattle, an annual convergence of music writers (journalists and academics alike). My own presentation is on that ol “Zunguzung” meme and will follow the zigzagging melody from Yellowman to Jin, with plenty of stops along the way, examining how such a musical figure articulates with time, place, and cultural politics (see abstract). Off to Seattle tomorrow to participate in this. I’ll be following what I’ve been calling the “Zunguzung Meme” from Kingston to Brooklyn to San Juan and back (w/ several stops along the way). — but I’m gonna do my best to gesture to the breadth and depth of all these musical migrations, and to think about what various instantiations might tell us about the way such a traveling tune informs meaning-making processes and cultural-political projects, from conscious invocations to subconscious rehearsals (esp as King Yellow’s catchy contour disappears into hip-hop lexicon). Sometimes cultural politics bleeds directly into, er, political politics, or politics qua politics, or electoral / “party” politics. E.g., watch how Cutty Ranks meks the meme big up Michael Manley & move the crowd at a mid-80s PNP rally. In such a socially and musically compelling context, wouldn’t you “put up your hand”? Nuff to say. 20 minutes to say it. 6 million ways. Guess I’ll have to choose one. Miguel Luciano transforms the image of the plantain or platano from a stereotype to an icon in his Pure Plantinum series. 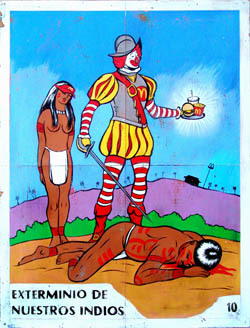 He explores this complex symbol of Caribbean culture, embedded with layered references to race and class, through associations with the exploitation of field laborers, and its pejorative use as slang for Puerto Rican and Dominican immigrants. An actual green plantain was cast in metal and plated with precious platinum, the giant-sized pendant hangs on a platinum chain and is displayed here as a precious object. It was also photographed in the window of King of Platinum, a store in Harlem, where it is presented as an emblematic token of respect. An object imbued with value in the context of today’s hyper-materialism. 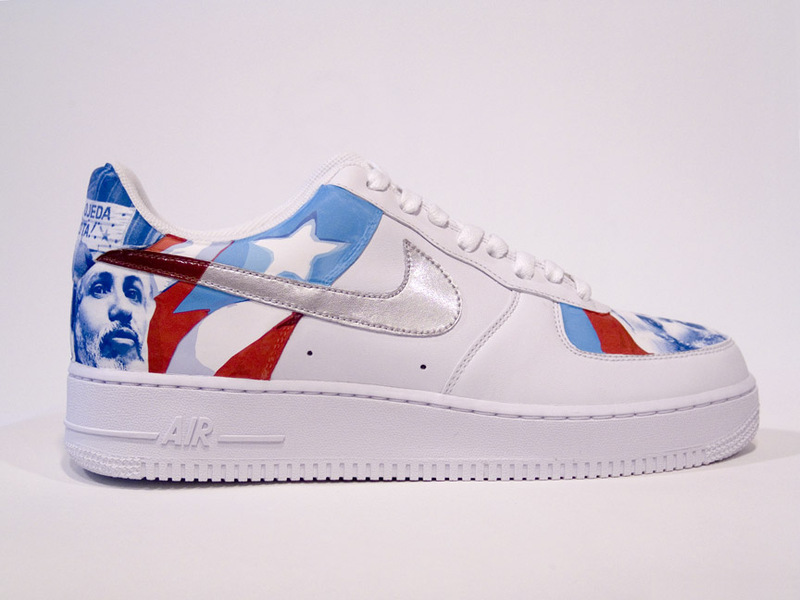 For me, it hurts to look at Filiberto–icon of armed struggle for Puerto Rican independence assasinated in 2005 by the F.B.I.–emblazoned all over these sneakers. I find this piece to be an insightful and deeply disturbing commentary on our consumption-obsessed lives, particularly painful in the context of Puerto Rico’s colonial relationship to the United States. 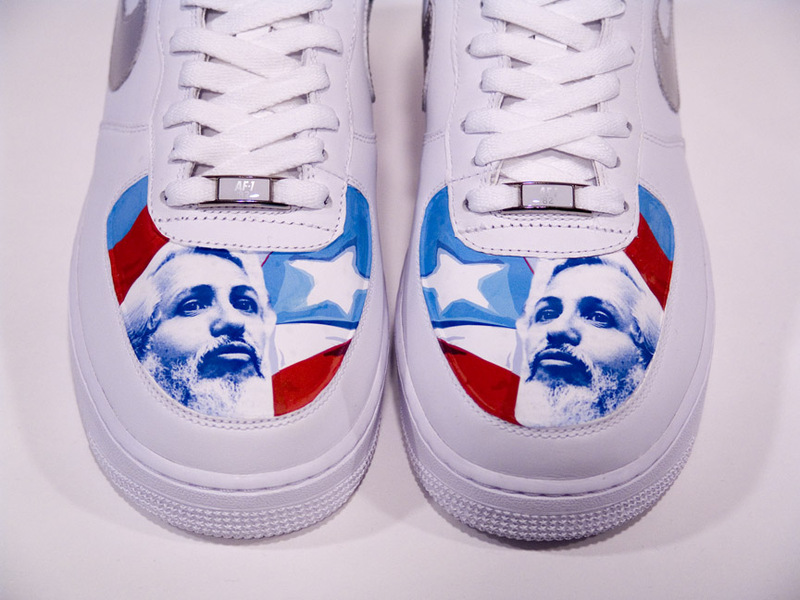 The Filiberto Ojeda Uptowns / Machetero Air Force Ones are a customized pair of Nike sneakers that pay tribute to the assassinated leader of the Macheteros, a clandestine group of Puerto Rican nationalists who’ve campaigned for independence in Puerto Rico since the 1970’s. Filiberto Ojeda was brutally assassinated by the F.B.I. 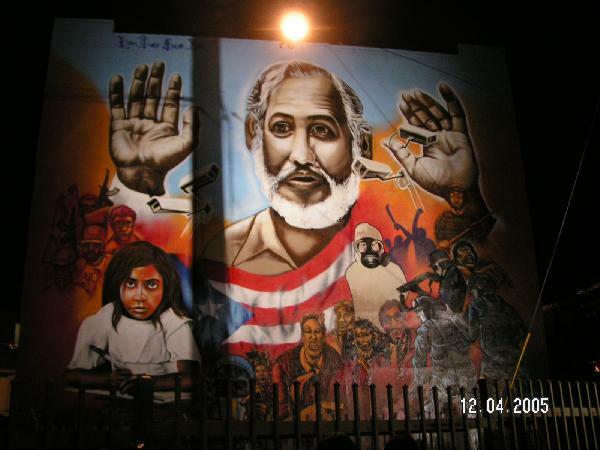 on September 23, 2005 and has since been revered by many as the “Puerto Rican Che Guevara”. A pair of Nike sneakers become an unlikely vehicle of veneration for the fallen leader that both complicate and question how nationalism and resistance are embodied within today’s colonial consumerist society. Nevertheless, they engage alternative strategies towards reconstructing symbols of resistance from the objects of material desire, while questioning the commodification of Revolution. The Machetero Air Force Ones transform Nike’s Swoosh logo into a ready-made Machete symbol, as the mantra of Nike’s “goddess of victory” gives way to “hasta la victoria siempre”. Have it your way? Just do it? This is why we hot? Incidentally/apropros! — if you’ve checked the “play” page recently, you might have noticed that I will be presenting next week @ EMP in Seattle. Kicking off the panel I’m on will be none other than Erin MacLeod and Dave Stelfox, talking about, u guessed it, screw(ed) music. Another way to get at such a thing would be to take stock of the specific reggae records that have become staples in the crates of hip-hop DJs — the sorts of sides one hears, almost as a matter of course, at hip-hop events across the US. With the exception of the odd Bob Marley joint, these records are mostly dancehall reggae, esp from the early 90s and around the turn of millennium (see, e.g., this tracklist). This alternate oeuvre offers an interesting representation of reggae, departing significantly from the core repertory for, say, reggae selectors (in the US or elsewhere, bashment or roots). In that sense, given the difference with respect to what might be thought of as a more authoritative position on reggae, hip-hop’s reggae selects a special slice of the genre — and speaks volumes about hip-hop. It also says a lot about canons. What makes the reggae selector’s reggae canon, for example, any more legitimate (or revealing about reggae’s character) than the hip-hop DJ’s reggae canon? What might hip-hop’s take on reggae tell us not only about hip-hop but about reggae? What would we lose by overlooking hip-hop’s “counter canon,” if you will? I’m not crazy about the term — or about perpetuating canonization — but what I like about the idea of the “counter canon” is the way it decenters canon’s commonplace claim to truth about greatness, calling attn instead to the role of perspective, to (contextual) differences in aesthetic values, to the subjective rather than objective nature of what comes to define a genre. I’m not prepared to offer an in-depth treatise on hip-hop’s reggae “counter canon” on this humble blog at the moment, but I bring all of this up in order to throw it out there — I suspect there are parallels to other dialectical if asymmetrically interpenetrating formations (to coin a phrase), and I’d love to hear some ideas along those lines — and because last night’s gig proved no exception. Typically Zebo, Hess, and Chump tend to keep it pretty hip-hop-centric on Monday nights, if with the occasional dip into reggae, bmore, and general clubb eclectica. For my guest visit, tho, they decided to devote the night to reggae. Although I was impressed with the range and depth of the reggae selections they pulled out, including plenty of tracks I’d never heard, I was also happy to hear lots of the classics I figured I would hear (and which I therefore left out of my own set — for the most part — lest I be scooped): Sister Nancy’s “Bam Bam,” Chaka Demus & Pliers’ “Murder She Wrote,” Mad Cobra’s “Flex,” Shabba Ranks’s “Ting-a-Ling,” and so on. Toward the end of my set, which otherwise mixed 80s digi dancehall (via Jammy’s, Tubby’s, Winston Riley, George Phang) and a fair number of early 90s classics (Super Cat, Cutty Ranks, Buju, Shabba), I started dropping in some more recent reggae/hip-hop remixes, which perhaps point to another (emerging) area of activity in all of this overlap. If nothing else, they offer yet another way to play reggae to a hip-hop crowd, familiar acapella as anchor.